Over the summer I went to the Hero Arts Factory Store with a friend, and I picked up the cute Birds and Branches stamp set while I was there. 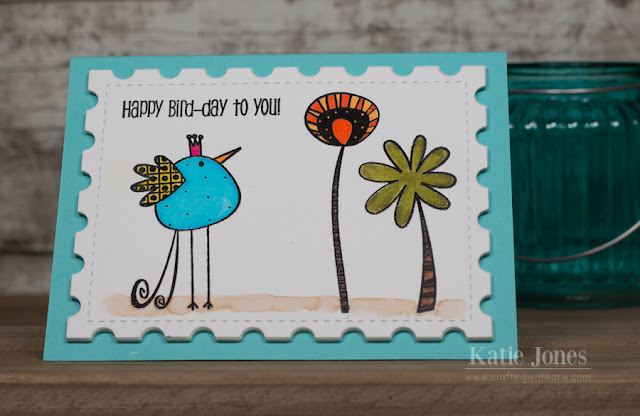 I love the whimsical birds and trees in it! I stamped them with Versafine Onyx Black Ink and heat embossed them with clear embossing powder onto some Strathmore Bristol Cardstock that I had cut with a My Creative Time Stitched Postage Frame Die. Then I had lots of fun coloring the images with my Zig Clean Color Real Brush Pens! The sentiment is from MCT's Tweet Me.